Position your patient before your intubate. ​Unless your patient is dead and receiving chest compressions, you should optimize positioning prior to intubation. Better positioning improves your view and your chances of first-pass success without complications. Here I offer a basic and categorical approach to positioning based on on the type of patient and situation at hand; normal habitus, overweight, and trauma. ​Imagine laying your patient flat and peering into the mouth. Your line of sight is along the oral axis (OA) and gives you a view of the oropharynx. If you intubated in this position, you would need to exert a lot of force to distract the anterior tissues away from your line of sight of the glottis. The sniffing position aligns the oral axis towards the axes of the cavity of the pharynx (pharyngeal axis - PA) and the larynx and trachea (laryngeal axis - LA). Place towels or blankets behind the head to flex the lower cervical spine and bring the external auditory meatus to the level of the sternal angle. Atlanto-occipital extension further aligns these three axes. The sniffing position should require less force to displace the anterior tissues away from your line of sight of the glottic opening. Part Two: The Overweight Patient and the Ramp. The overweight patient deserves some further consideration. It is especially important to place the overweight patient in the sniffing position given the larger amount of force that is otherwise required to displace the redundant pharyngeal tissue. The relatively heavier chest wall of the obese patient makes ventilation difficult and reduces safe apnea time. Build a ramp to elevate the patient's torso such that the chest wall tissues slide downward and away from the lungs. This will improve preoxygenation and prolong the duration of time before desaturation during your intubation attempt. There are different ways to go about building a ramp, but the simplest way in the emergency department is to place linens or pillows under the shoulders. This can be coupled with elevating the head of the bed of the gurney so the torso is angled 30 degrees to the waist. As before, the ear canal should be level with the sternum. 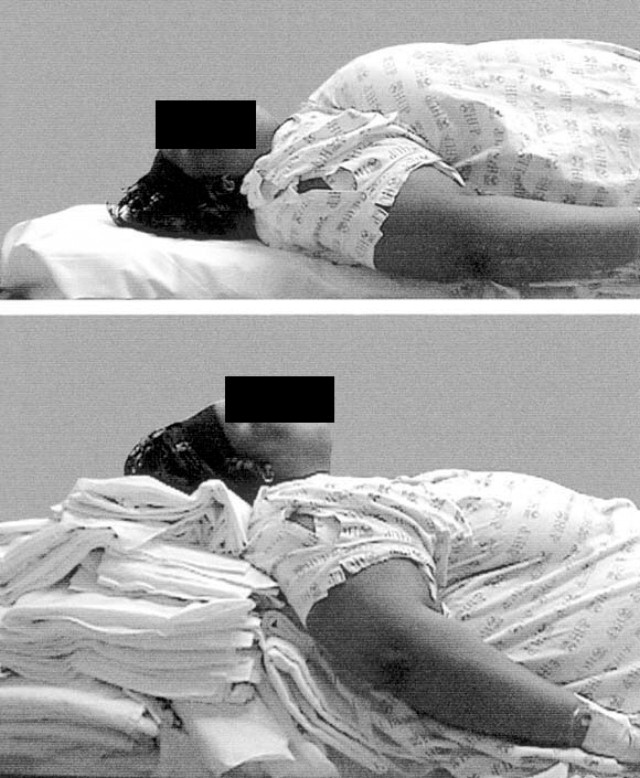 The ramped position has been shown to be superior to sniffing position for electively intubated obese patients. There is some research that using a ramp improves the laryngoscopic view and decreases complication rates in patients regardless of BMI. 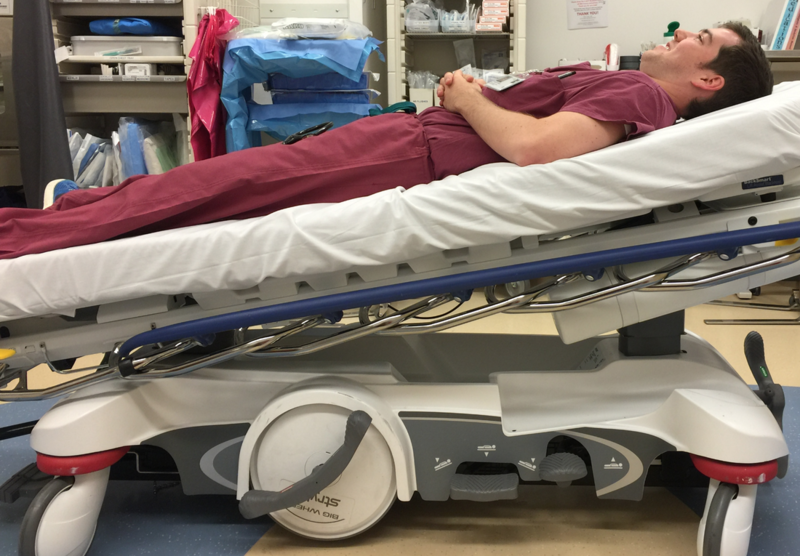 For the trauma patient who is C-spine (or total spine) precautions, it will not be possible to maneuver the patient into a sniffing or ramped position. However, a ramped position can be approximated by angling the entire bed into reverse Trendelenberg until the ear canal is level with the sternal notch. As with any trauma patient, the c-collar should be temporarily removed during intubation while an assistant holds the patient in manual in-line stabilization (MILS), as demonstrated here.